Dr. Chad Simons joined the faculty of the University of New Mexico in 2005. 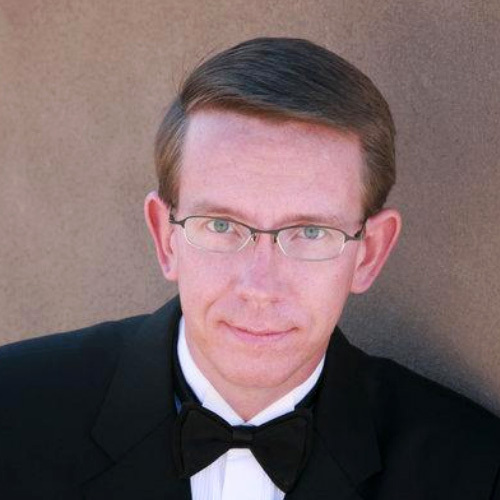 As the Associate Director of Bands and an Associate Professor of Music, Dr. Simons conducts the UNM Symphonic Band, directs all facets of the UNM athletic band program, teaches conducting lessons, and serves as the associate conductor of the UNM Wind Symphony. He also teaches courses in conducting, instrumental repertoire, marching band methods, and serves on UNM’s student teacher observation team. For the past eleven years, Dr. Simons has been the Director of the Zia Marching Band Fiesta. The Fiesta is a BOA formatted event that features 32 bands in preliminary and finals competition. Zia is one of the premiere marching band competitions in the southwest. Dr. Simons has extensive experience building and maintaining quality secondary and collegiate band programs. Before coming to New Mexico, he served as the Associate Director of Bands at Idaho State University, Pocatello, and as a public school music teacher in his home state of Montana. Active as a clinician, adjudicator, and guest conductor, Dr. Simons has given clinics, presented a variety of lectures, and conducted concert bands across the country. He is published in Teaching Music Through Performance in Band, Volume I, and has produced, collaborated on, or directed numerous professional recordings. An advocate of new music for winds and percussion, Dr. Simons has had the opportunity to work with composers such as Michael Colgrass, Steven Gryc, Joseph Turrin, Bob Mintzer, Thom Ritter George, Robert Spittal, Jennifer Higdon, Gregory Youtz, Dan McIntosh, and Joni Greene. The UNM Symphonic Band regularly premieres new works for band. Professor Simons holds a Bachelor of Music Education from the University of Montana, Missoula, where he graduated with a president’s recognition award, a Master of Music in Wind Conducting from Oklahoma State University, Stillwater, and a Doctorate in Wind Conducting from the University of Kansas, Lawrence. Professional affiliations include the College Band Directors National Association, Percussive Arts Society, and the Gamma Iota chapter of Kappa Kappa Psi. Dr. Simons lives in Albuquerque with his wife, Rebecca.